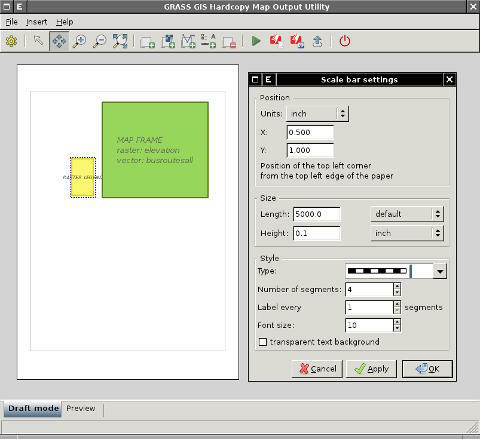 g.gui.psmap - Tool for creating hardcopy map outputs. wxGUI Cartographic Composer also called wx.psmap is a wxGUI extension which allows the user to create interactively hardcopy map outputs. This tool generates ps.map configuration file and then runs ps.map to create PostScript output. There are two modes - Draft mode for map composing and Preview mode (requires Python Imaging Library) to see how the result will look like. In draft mode map features (like legend or scalebar) are represented by a colored rectangle with a label. Cartographic Composer enables to load in saved instructions file. Loading instruction files created by Cartographic Composer is more robust, as opposed to loading files created manually. Generates and saves text file with mapping instructions. Load text file with mapping instructions. Specify paper size, margins and orientation. Drag the pan cursor while pressing the left mouse button to move your view. Interactive zooming with the mouse in both draft and preview mode. Drawing a box or just a left click with the mouse and zoom-in cursor causes the display to zoom in so that the area defined by the box fills the display. Interactive zooming with the mouse in both draft and preview mode. Drawing a box or just a left click with the mouse and zoom-out cursor causes the display to zoom out so that the area displayed shrinks to fill the area defined by the box. Click and drag to place map frame. If map frame is already drawn, open a dialog to set its properties. Shows a dialog to add or change the raster map. Select which data type to draw. In case of point data, points or centroids can be drawn, in case of line data, lines or boundaries. Select layer and limit data by a SQL query or chose only certain categories. Whether to use mask or not. Select outline color and width in points. In case of lines, outline means highlighting. Select fill color, one color for all vector elements or color from rgb column. Available for point data. Choose symbol or EPS file to draw points with. Available for areas. Choose pattern file and set the width of the pattern. Available for point data. Choose size (number of times larger than the size in the icon file) as a single value or take the size from a map table column. Available for line data. Set line width in points or take the value from a map table column. Add vector labels created beforehand by v.label module. Add raster or vector legend or edit their properties. Add information about region, grid and scale or edit map info properties. Add scalebar or edit its properties. Select an object and remove it. Pressing Delete key does the same. Generates output and switches to Preview mode to see the result. Be patient, it can take a while. Generates hardcopy map output in PostScript/EPS file. Generates hardcopy map output in PDF using ps2pdf.